Description: A south bound taconite train meets an empty coal train. Description: This empty coal move is seen stopped for a aproching NS train. The coal loads run south with three units in the laed and two DPUs at the rear. Some times the DPUs are placed on the head end for the return trip as seen here. Description: The Heritage I pusher on the right has come to a halt while the "Executive" is powering up. Two east bounders. Description: Sorry about how dark it is, see that kid right by the gate, he's the one who picked the spot..... Hahahaha. Description: Train #882 swings into La Crosse on a beautiful spring morning! Description: Train #882 storms through Bangor WI. Description: A pair of CP ES44's is the first of five units at the disposal of the crew of this empty westbound coal train. The lead units of the lashup running on rails well to the south of their usual haunts on the Paynesville Sub. Description: Two GE's and three EMD's are the impressive lashup about to split the signals at the West Wayzata end of the siding stretching from western Wayzata to eastern Long Lake on the BNSF Wayzata sub. Description: loaded rock train heading back to the yard. Title: BNSF 6266 Rolls a crude oil Sb. Description: heading into the town of elsberry mo. Description: A BNSF southbound crude oil load heads through Litchfield towards Toland where it will proceed south on the UP en route to Saint James, LA. Description: CP Train 810, BNSF-9885-9479-9987. 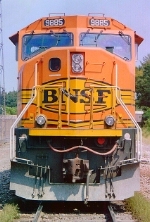 Title: NS 9871 Sits beside the BNSF 4464 at Mitchell IL. Description: The cigar band is always good to see. Description: It's always nice to see a narrow nose in the lead. This is K045 crossing 138th Street. Description: BNSF 9885 with early char-broiled panels pushing behind a coal drag headed north.